Over the years we have assembled a variety of tools for evaluting tuner performance. Most of these are internal home-grown command line utilities and scripts which perform some superset of comparable end-user applications, with a particular emphasis on automation and logging statistics that regular users typically wouldn’t need. These are tools we use every day against our own drivers to establish confidence that we’re delivering a high quality product. After all, how can you claim to have a high quality product if you’re not actually measuring in some objective way? 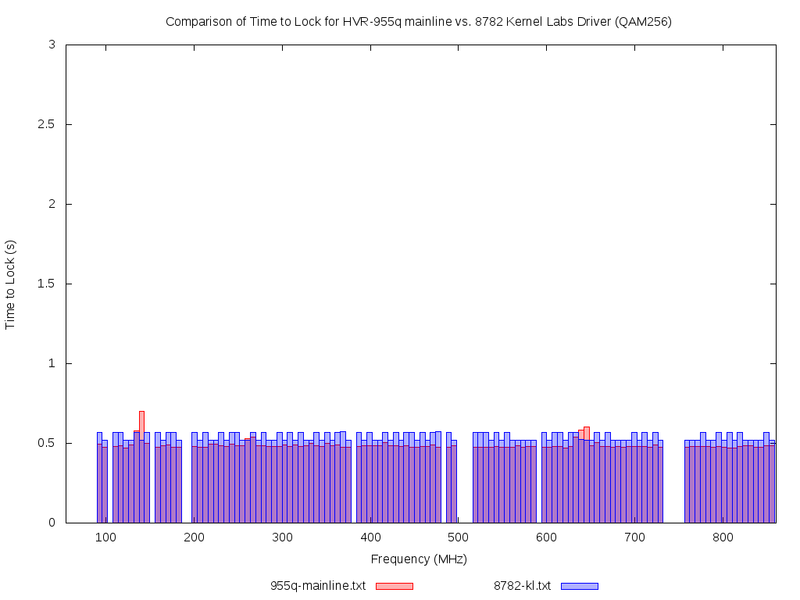 We have been running the tools againt our driver for the HVR-955q for months on a regular basis, at this point mostly just to catch regressions that might have snuck in during development for other tuners. However as a result of some unrelated work, I happened to install the latest open source media_build tree, which included the recently upstreamed open source driver for the HVR-955q. This provided an ideal opportunity to do a bit of comparison. 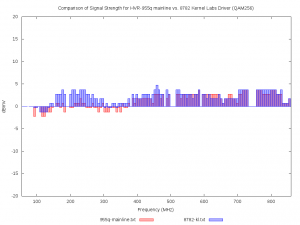 Does the open source driver have better signal performance than ours in any specific cases? If so, why, and how do I fix it? Does the open source driver manage to get a lock on any channels that our driver missed? If so, why? Do we see comparable tuning time for typical use cases? If not, why? In short, these are mostly sanity checks to ensure we didn’t do anything really dumb that we weren’t already catching. As you can see from the above, we’re locking on all the same channels (i.e. no channels missed), and the SNR is pretty much the same between the two (within 1dB). There might be a bit of opportunity for fine-tuning, but I would probably first need to make sure the means of computing the SNR are identical (i.e. the variation might just be a difference in the SNR algorithm). 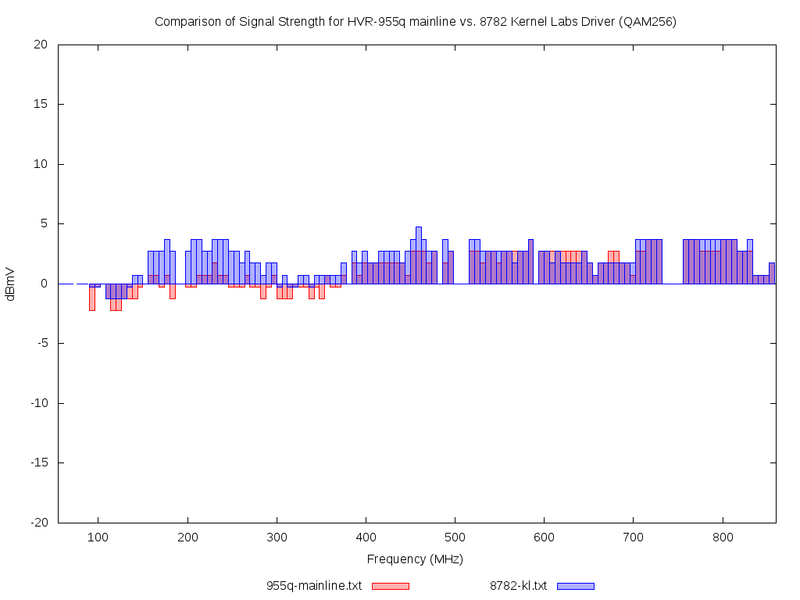 Based on the above, the we’re seeing pretty much the same trend for signal power delivered to the tuner (+/- 1 dBmV). That said, there does appear to be something going on in the open source driver where it doesn’t perform as well below 375 MHz, where if the results were reversed I would want to better understand what was going on there. 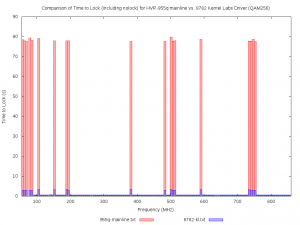 This might suggest a case where the driver wouldn’t perform as well in weak signal conditions. Why on Earth is the scan taking so long when run against the open source driver? 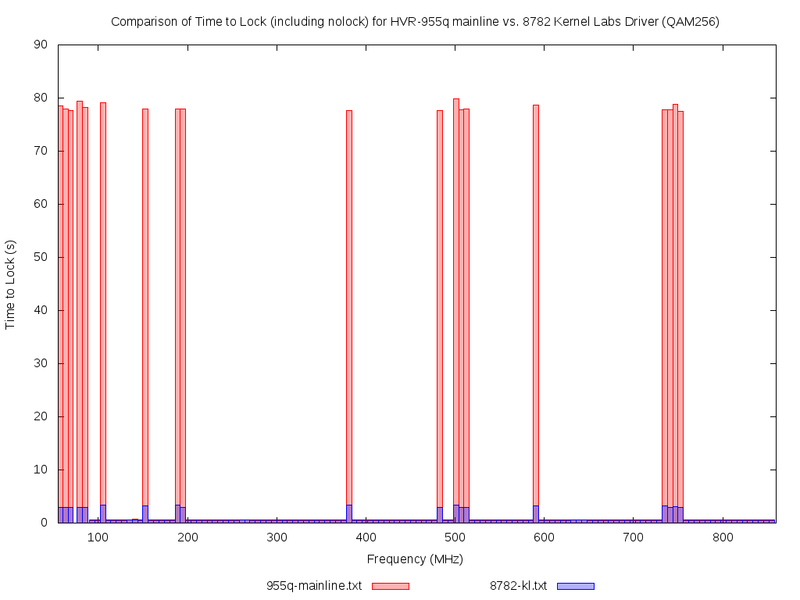 That looks nice and consistent (locking consistently within 50ms between the open source and Kernel Labs driver). Again, perhaps an opportunity for a bit more fine tuning, but nothing bad going on here. Hmmm, so with the Kernel Labs driver it consistently takes 3 seconds to give up on channel tuning, and with the open source driver it takes ***80*** seconds. 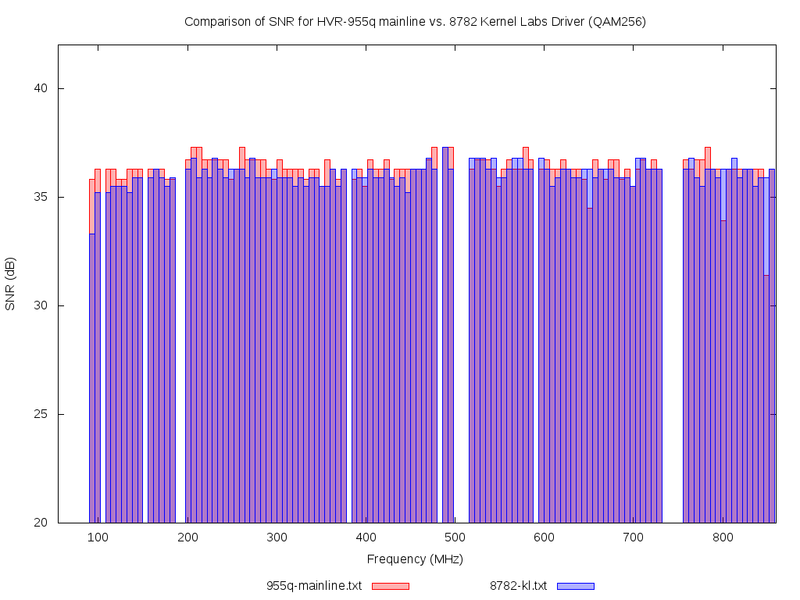 The total scan time when run against the Kernel Labs driver is about 14 minutes, whereas with the open source driver it was 34 minutes. Going back to my assumption that my tool was broken, I tried the same test with the stock Linux DVB /usr/bin/scan tool. Guess what? I got the same results. Yup, it takes over two hours to do a QAM 256 scan of a cable plant where no channels are found. Ouch. Commercial customers often deploy against custom cable headends where they have only a few QAM modulators present, as opposed to a public cable headend provided by an MSO. In such a case you might get a signal lock on a dozen valid channels and 100+ empty channels. Commercial customers will often write their application to try all three scan types against a given cable feed (i.e. 8VSB, QAM64, QAM256), since they don’t trust the user to be able to specify whether their source is terrestrial or cable. Such a scan would take upwards of *six hours* with the open source driver, whereas it would take only around 20 minutes with the Kernel Labs driver. If stating a product is of high quality is the result of measurement, who among the people responsible for the open source driver is measuring its performance? As I originally suggested in the previous blog post where I announced the availability of the Kernel Labs HVR-955q driver, the open source driver is probably “good enough” for consumers, but if you’re a business that depends on tuners working well, it probably makes sense to go with a product specifically intended for that audience.